Drumroll please…. 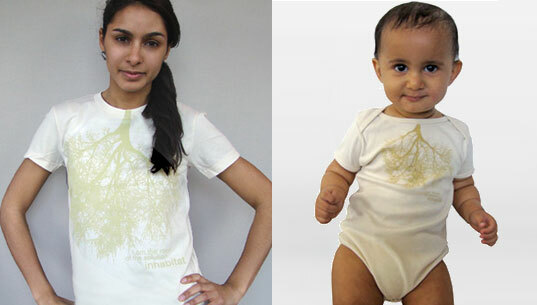 We are thrilled to announce our new line of Inhabitots organic baby tees and onesies. Featuring ‘Habby’, our owly mascot, these adorable baby tees are made from 100% organic cotton and are hand-printed with eco-friendly, water-based inks. The tagline (with some fond nostalgia for the 70’s US Forest Service Campaign), reads ‘I give a hoot’. Show your support for Inhabitots and eco design by ordering one today – proceeds go to support Inhabitots and Inhabitat. You can win a free Inhabitots T-shirt in our Green Halloween contest if your photo entry is chosen as a winner. So if you have any creative costume or treat ideas, please submit them to the Inhabitots Green Halloween costume contest, and one of these cute eco tees could be all yours. For those who don’t like owls or want something a bit more subtle and sophisticated for their tot, we also now have a mini version of the Inhabitat roots T-shirt for babies. 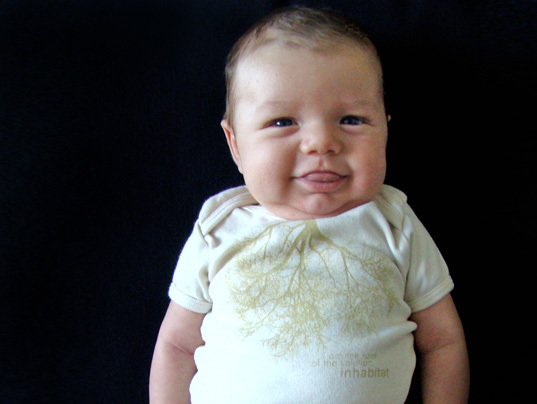 Just like the grownup Inhabitat roots T-shirt, the baby roots onesie is 100% organic cotton and printed with eco-friendly water-based inks. Now you can go all match-matchy with your baby if you want to play like that. The graphic is designed to look both like tree roots and human lungs, symbolizing that trees are ‘lungs’ of the planet. The tagline reads ‘I am the root of the solution’.